I would first like to start by saying thanks to the race fans, sponsors, and the racing community as a whole. I’ve been racing in the AHDRA for 12 seasons now and I think the time has come for me to retire. It’s been a great experience; racing with friends, spending time at the track, and being on the road are just some of the things that really made racing a passion of mine. Starting in the Pro Modified division in 2000 we followed the advance of the class into the evolution of Pro Stock in 2007. While in Pro Stock we won National Championships in 2008, 2009, and 2011. We also had a runner up for National Champion in 2010. In 2012 we were given the opportunity to race in the Pro Modified division with Frank Capone. 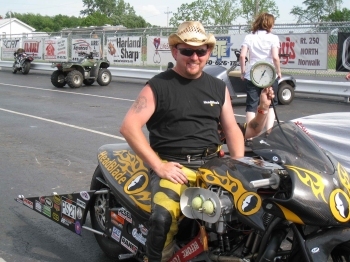 With a successful season in 2012, teammate Frank Capone won the national championship and we followed in 3rd. We appreciated the hospitality of Frank and his crew and we couldn’t have thought of a better way to close our racing career. Its been a great time on the track, but all good things must come to an end. We’ve been extremely fortunate to have Todd Green the owner of The HeadBlade Company supporting us for 12 seasons. 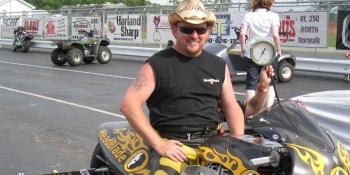 Not only was Todd a great member of The HeadBlade Racing Team, he was also a great friend. We have had a great relationship for 12 years, and have made great strides to be constant performers on the track. We would like to wish The HeadBlade Company and Frank Capone the best of luck in the coming years. I want to thank my wonderful family for their support, my beautiful wife, Kim Reno, for her constant understanding, and my crew chief Ricky Stewart. A very special thanks to my mother Jane Reno, for being influential in my life and allowing me to follow my dreams in racing and motorcycles.